Etcetera Morris Men are a Cotswold Morris side (team) based in Enfield. We meet and practice on Monday evenings, 20:00 – 21:45, in the Drama Studio of Chace Community School in Enfield. New members are always welcomed, so if you would like to try the Morris, please come along. We were founded in September 1974, with a first public appearance in 1975. We attained full membership of The Morris Ring in 1981. Nowadays, we perform dances from the Fieldtown, Bampton, Bledington and Adderbury traditions, along with a few we’ve created ourselves down the years based on these styles. We dance in and around the Enfield area, and enjoy visiting other sides around the country as well. If you would like to book Etcetera Morris Men or want more information visit the Contact us page. Etcetera Morris Men’s name is drawn from our first practice venue – Enfield Teachers Centre. Many of the original members were teachers, or married to them. The name has stuck but we remain proud to represent Enfield as the local Cotswold Morris dancing team. An Etcetera Morris Man dancer wears a bowler hat covered in flowers, a plain white shirt, green and blue baldrics (cross-bands), plain black breeches, bells with green and blue sashes, plain white socks, black shoes and carries white handkerchiefs (and maybe a pewter tankard!). Our bowler hats represent the “city gents” of our suburban origin, with our blue and green colours symbolising the New River and the Green Belt that have shaped Enfield. Musicians wear long black trousers and a green waistcoat, with their rosette or Beast on display. If it’s a bit nippy out, you might see some of us in blue fleeces too! The Fool wears the same basic outfit as one of the Etcetera Morris Men but with a few small changes in the form of a top hat, odd socks and mis-matched coloured handkerchiefs, and the addition of a black tail coat covered in his eclectic collection of badges and the Beast embroidered on the back. Etcetera Morris Men’s animal is The Beast – you may see him out and about with us. While new members start with a simple rosette in the middle of their baldrics, once a member reaches the required level of dancing or playing they will receive a badge of membership in the form of a Beast to place in the middle of their baldrics. The Beast is actually an Enfield. 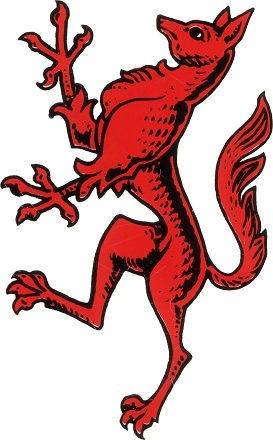 This heraldic creature is a key part of the Enfield Crest (right), locally rumoured to represent the five literal and metaphorical aspects of the Chase – where Monarchs and their nobles used to hunt – namely the head of a fox, the breast of a lion, the talons of an eagle, the hind quarters of a deer and the tail of a horse.